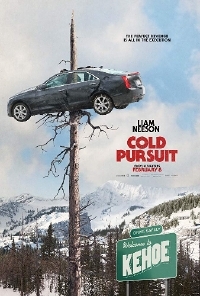 Seems like Liam Neeson can't catch a break on screen; something is constantly happening to his family and he's having to save them (except in Widows - and if you haven't seen that yet, you need to do yourself a favour and rectify that sooner rather than later) but in the case of Cold Pursuit it's too late for rescuing and instead, he's avenging the death of his son. Norwegian director Hans Petter Moland is going back to the well for round two. Cold Pursuit is a remake of the director's 2014 thriller In Order of Disappearance which stars the great Stellan Skarsgård. The remake stars Neeson as a snowplow driver who seeks revenge against the drug dealers he believes are behind his son's death. The movie co-stars Emmy Rossum and Laura Dern. I'm a fan of Liam Neeson as an action hero but the Taken framework was getting a bit tired. This isn't too much of a deviation but the trappings are different enough that this feels a little fresher. Cold Pursuit opens February 8.